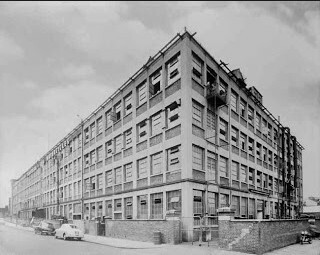 This website aims to throw some light on the people whose enthusiasm for motor bikes drew them to work at the Plumstead Road, S E London factory of Associated Motor Cycles, where the world-famous products of Matchless, AJS and (latterly) Norton were designed, manufactured and assembled. As well as giving a general history of the factory, this website hopes to provides an in-depth look at each of the many departments in turn, giving an insight into the day-to-day work undertaken, the tools and machinery employed and the various skills of the workforce necessary to undertake the tasks involved in playing their part in the production of a large range of first-class motorcycles. Information on known personnel is included on each department page, all of which has have been extracted from a list painstakingly compiled over many years by several ex-AMC employees, without the benefit of access to official company records. In consequence, there will be numerous omissions and inaccuracies which we hope, with help, may be rectified over time. The content on the site represents the combined knowledge of the authors who both served apprenticeships in the factory, followed by several years in the Design and Drawing Offices, back in the 1960s. As around fifty years has passed since then, memories have faded and hard information has become ever more difficult to find, to verify what we remember. So, if you have had any contact with the factory over its years of existence, and have any information, corrections, pictures, etc. that you feel would enhance the site, please contact the authors who would be very grateful for your contributions to this ongoing project.